An effective advertising medium printed Shade Cloth and Mesh Wrap have multiple uses. They are an effective way to promote your business for construction sites, scaffolding, and building companies and also for outdoor concerts, other big cultural and sporting events. They are used to communicate logos, contact details, images and brand messages. 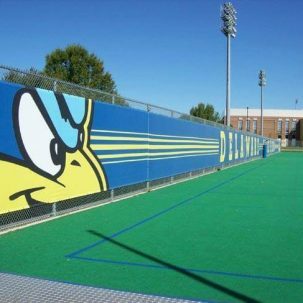 Wraps make areas more vibrant and are also used to conceal certain areas for aesthetic or security reason. As the wraps are also digitally printed there are no colour or design constraints and graphics can be simple and basic or colourful with full imaging – depending on the material used. A building wrap covering a whole building in printed signage is both dramatic and powerful. Usually a massive canvas they are a relatively new form of advertising in New Zealand and can be used to wrap a facade as an advertising platform for brands or to create visuals that entertain, surprise and delight. 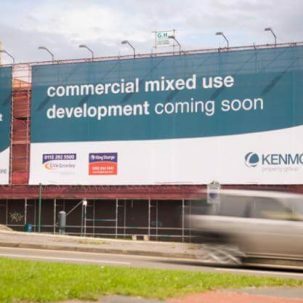 Alternatively, they can be used as smaller scaffold banners to wrap a building for multiple messages and creativity. Created from a permeable substrate printed shade cloth is a low cost and highly practical medium that allows for straightforward branding and customised outdoor advertising options for construction, scaffolding, buildings and businesses. They are easy to attach to various structures, allowing for light and low risk loads with considerable durability in harsh conditions. Great price point. Simple messaging. Easy to install. Custom printed banner mesh is our most popular product with high print quality, versatility and excellent durability. Either standard or premium for different applications (9 versus 12 threads per inch) it can be used on applications from scaffolds to temporary fences providing advertising opportunities. You choice depends on your need for more or less permeable options and greater or lesser print quality. Fence panels are the ideal temporary fence signage solutions that come in different shapes and sizes providing flexibility when you need it most. 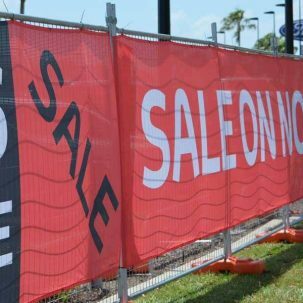 These alternatives provide a wide range of format printed banners and signs for most construction and subdivision applications such as printed banner mesh, mesh banners, mesh fence panels, printed shade cloth/scrim, safety signs, fence signs, vinyl banners and more.